As was the case with the former Ireland manager, the Italian’s job could tonight be jeopardised by Austria. 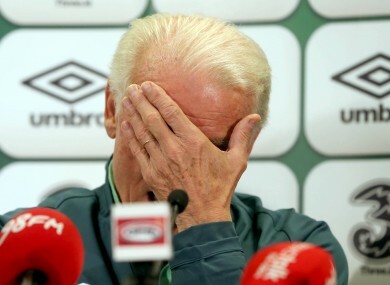 Republic of Ireland manager Giovanni Trapattoni. F SCOTT FITZGERALD once wrote that “there are no second acts in American lives,” and it is not too much of a stretch applying the quote to managers of the Irish football team. Generally speaking, the narrative with each incoming boss who has accepted this dubious honour is the same — an initially encouraging period, followed by a slow and painful decline back into international irrelevance. The Charlton years began with a wave of positivity and the side’s first-ever qualification for the Euros, Ireland slowly got better and better during Mick McCarthy’s tenure and with Trap, they at least have the noble failure of Paris and Euro qualification to look back on. And even Steve Staunton’s ill-fated regime began with a highly promising 3-0 victory over Sweden. Yet in each case, there has been a certain stage where a sense of impending dread takes over and seemingly serves as a point of no return — as if inglorious failure and the manager’s sacking is almost inevitable thereafter. With Charlton, it was the 0-0 draw with Liechtenstein, with McCarthy, it was the post-2002-World-Cup comedown and with Staunton, it was everything after the Sweden game. For Trap, it seems, the moment was the 6-1 hammering by Germany. It shattered any lingering illusions people still had of him as the eccentric genius who got a distinctly average Ireland side to the Euros. It seemed as if even the players who he showed such loyalty to had, for the most part, lost faith in the system he stubbornly refuses to disown. While, since then, the 0-0 draw with Sweden showed signs that Ireland might still be capable of turning a corner, more or less every big game thereafter has felt like a mediocre horror movie with an all-too-predictable ending. What’s especially striking, though, is the sense of deja vu that most Irish fans are undoubtedly feeling right now. It very much seems like the end of something — just as it did with Messrs Charlton, McCarthy and Staunton, long before they actually left their posts. The Charlton parallels, in particular, are heavily apparent. A recently published piece on this website recalled Ireland’s depressing decline under the Englishman, and included the following quotes from Ray Houghton, a player in the side at the time. “When you look back now, those results were the beginning of the end,” he said. “You could sense something wasn’t right. Whether Jack was fully in control, like the way he was before, is up for discussion. Substitute ‘Giovanni’ for ‘Jack’ and those quotes would make equal sense in the context of the present situation. And the comparisons don’t end there; in fact, they are endless. Both managers played a style of football that was always unpopular among a number of people but (initially, at least) brought the side satisfactory results. Both managers suffered severe setbacks at the hands of Austria. Both controversially omitted certain players at times (Liam Brady, David O’Leary, Seamus Coleman, Wes Hoolahan). Moreover, the chaotic closing stages of the Charlton era were epitomised by the now-infamous ‘Harry’s Challenge’ incident recounted in Roy Keane’s autobiography. One wonders if a similarly embarrassing story may eventually emerge once Trap leaves (Ian Harte has spoken of a supposedly foolish text that the Italian manager was alleged to have sent). Yet, in many other ways, Trap’s side are vastly different from their 90s counterparts and indeed, it seems as if this Irish team is a pale imitation or parody of the Charlton era to a degree. They had Italia 90, we had Euro 2012. They drew with Liechtenstein, we refused to demonstrate such epic incompetence. They had Paul McGrath, we have Paul Green. They had put em’ under pressure, we have an extremely limp version of ‘Catenaccio’. They had the burgeoning Celtic Tiger, we have the recession. In short though, there is one key difference between the only two foreign coaches to ever manage Ireland, and the way they urged their teams to play. While both their styles were seldom attractive on the eye, there was something lovable about the plucky Irish sides that Charlton produced at his best — their energy and efficiency was a joy to behold. Whereas with Trap, even the laboriously executed victories have invariably felt hollow, largely due to the painstakingly negative manner in which they are undertaken. Accordingly, there was a feel-good factor surrounding Charlton and his team for much of his time in charge, but the Irish public has never truly embraced Trapattoni and his ways, despite enjoying partial success (by the Irish team’s standards) under the Italian. John Giles summed it up beautifully in the RTÉ studio last Friday, saying he simply “didn’t care” at the end of the Sweden game. And there has long been a similar, irrevocable apathy among fans, with regards to Trap and his team. When he leaves, few will be shedding any tears. Email “Opinion: Why Trap's Ireland are starting to resemble a bad parody of the Charlton years”. Feedback on “Opinion: Why Trap's Ireland are starting to resemble a bad parody of the Charlton years”.